I felt great satisfaction and relief when I recently placed another two large bags of my used and still wearable clothes on my front porch for pickup. As the saying goes, one person’s trash is another person’s treasure. This time, my “castoffs” went to the Ontario Foundation for Cerebral Palsy. Their free pick-ups service the Greater Toronto area, as well as several other cities in southern Ontario. The sale of their items to Value Village generates funds to help their members with assistive devices, research grants and awards, and provides education, therapeutic services, and social activities for children with cerebral palsy. Anyone wanting to buy affordable, lightly used clothing can then go to stores like Value Village, Goodwill, the Salvation Army or other second-hand or consignment stores, like Kind Exchange or Second Nature to find something that is new to them. Price tags vary between not-for-profit or charity stores and the designer boutiques, yet they all have something valuable in common: they keep clothing out of landfill. A recent study in Ontario concluded that a staggering 85 per cent of discarded textiles end up in landfill. Based on data from Value Village, that amounts to 10.5 million tons of clothing – enough to fill the Rogers Stadium three times! Donating used clothing and textiles, like linens (tablecloths, bed covers, bed-sheets etc. ), to Canadian stores and organisations can help the local economy and benefit those who either like to or need to purchase low-cost items. 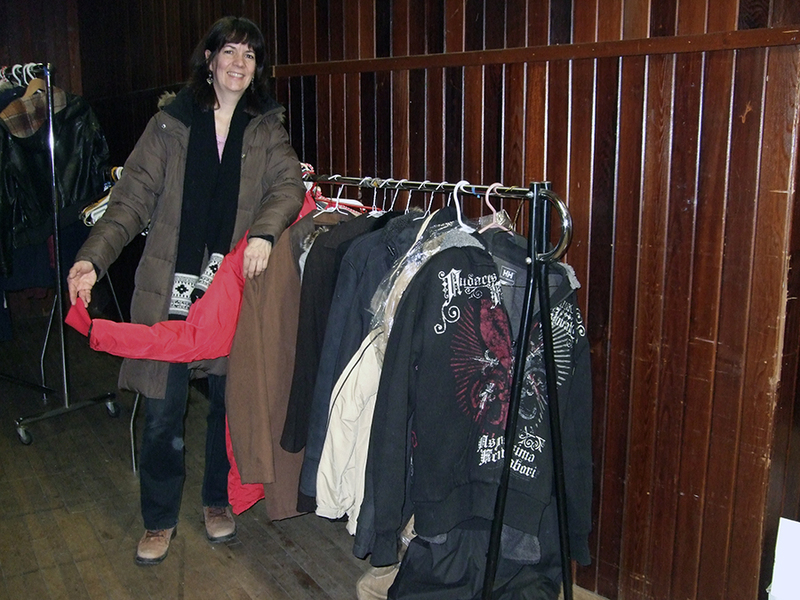 In the winter, Out Of The Cold Programs and other shelters across Toronto are always looking for donations of warm clothing. Some big retailers like American Eagle Outfitters, H&M, and Uniqlo accept clothing for recycling. Sometimes turning textile resales into big profit becomes a problem elsewhere though. In 2015, the trade value of used clothing exported from Canada to Kenya, for example, was US$17.8 million. This competes with local manufacturing and retail businesses, putting a strain on struggling economies in developing countries. I was unable to determine how best to avoid such businesses. The best I can suggest is dropping off one’s items at the nearest thrift store, or signing up online for local or regional organisations who pick it up. The most comprehensive list I found of local and some international clothes re-sellers and recyclers is on the website http://citywasteservices.ca/2016/12/15/the-essential-guide-to-clothes-donation-and-recycling-in-toronto/. The other problem is, of course, the sheer quantity of clothing today’s society goes through. Repairing and patching up clothes is no longer a necessity for most, and less desirable for outer wear that is visible – not like darning your socks. Hard to believe in some ways, when you look at the current (and utterly ridiculous, might I add) fashion of wearing jeans that have been severely cut and almost shredded, like something straight out of a slasher movie. And people pay to buy pants like that? I digress. Staying fashionable and on trend certainly has a social cost too in today’s throwaway culture. Today’s consumers in North America buy and discard five times as much clothing as they did 25 years ago, writes author Elizabeth Cline in Overdressed: The Shockingly High Cost of Cheap Fashion. This leads into a whole different story on sweat shops and so on. The City of Markham took their used clothing challenges a step further. In 2016, they joined forces with the Salvation Army and introduced a pilot program to recycle textiles. Through surveys they found that a common misconception by clothing donors was that only very good and undamaged clothing should be donated. Donation bins are now set up around Markham, which are emptied and sorted by the Salvation Army. While high-end brands can fetch good prices in charity stores, even unwearable textiles still have a dollar value. Your ripped pants, peek-a-boo socks, raggedy T-shirts and sweaters, or old blankets and bedding are compacted into 450 kilogram bales and sold. These fetch 20 cents per pound or around $200 per bale. Bales are then sold to private international companies who upcycle the items into rags, diapers, insulation, or specialised fibre-based materials for agriculture. Let’s hope the City of Toronto follows suit! Before you run to your wardrobe and start purging right now, you can take things a bit further and plan to unclutter your entire house and life by following the step-by-step book by Marie Kondo in The Life-Changing Magic of Tidying. On the other hand, an easy rule of thumb to go by is that for every new piece of clothing you bring home you should remove at least one from your wardrobe. Many people even find this process therapeutic. I do. Happy purging! Reduce how much new clothing you buy. Go for second-hand items or plan and buy only what you really need and will wear often. Repair small tears and undone seams or spend a little on a repair service instead of going straight for something new. Many dry-cleaners offer alterations and small repairs, or you can look up dates for the next Repairathon. Swap clothes with friends at a clothes swap party. Recycle by taking old clothes and textiles to a donation bin or store run by a charity, or look online for textile recycling companies. Toronto based non-profit organisations Dress Your Best and Dress For Success provide professional clothing (and career support) to anyone needing to dress for a job interview or new career. Upcycle – this means turning old clothing into something even better, e.g. turning worn T-shirts into a handmade one-of-a-kind braided rug, or when designers piece together used clothing fabrics to create a unique new piece. Find an upcycling company that you can donate to.